If you've earned points through GoDaddy Pro Rewards, you can redeem them for GoDaddy in-store credit. You get $0.01 USD for each point you've earned - so 500 points = $5.00 USD, 2500 points = $25.00 USD, and so on. 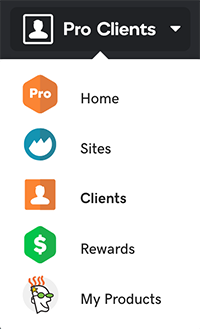 Click Pro Clients and then select Rewards. In the Points Overview section, click Redeem. Earn more points by adding products for your clients. After you pass 2500 points in a calendar year, you're promoted to Pro Plus status, and you can earn double the points for all additional eligible purchases.